French-speaker? Or just attracted by French Culture? We are an Australian French-speaking association based in the south of Sydney and our goal is to promote francophone culture in the St George and Sutherland Shire areas. We conduct various activities and events aimed at helping people, including French native speakers and everyone else, to discover and share their love of French-speaking culture. 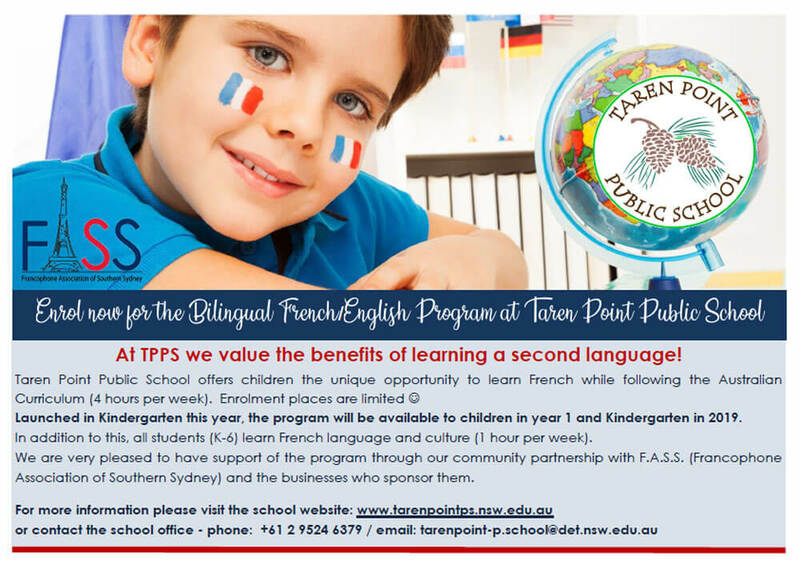 Taren Point Public School offers French language classes to all students (1 hour per week) from Kindergarten to Year 6. In partnership with FASS (Francophone Association of Southern Sydney), the school is now delighted to be offering families a French/English Bilingual Programme. The programme began in Kindergarten in 2018 and will be available for children in Kindergarten and Year 1 in 2019. We are very pleased to have received substantial community support in providing this program. The teacher will be parent funded and will team teach with the Kindergarten and Year 1 teachers. The amount of time students will receive with the French teacher will be determined by the number of participating students. Please note that places for this programme are limited.